When I finally get the games, Froakie is gonna be my starter. I love it's design and its theme with bubbles, it so cute! i'm definatley choosing Froakie! every one keeps saying hes ugly :c SCREW FENNEKIN AND CHESPIN!!! FROAKIES GOT MY VOTE!!! What I love most about Froakie, is that I know its evolution is going to have an epic beard I love how oshawott is passing the baton, as if it is the role of being a water starter! So cute! I like the idea of Oshawott passing it the baton. God, this is very cute! I'll fave this! This is cute I like it. Aww~ Oshawott is passing the baton onto Froakie! My two favorite water type starters! To me this shows the last game (Black and WHite) handing over the baton of popularity to then next generation. Have you ever seen the Super Sentai handoff? I feel for this the way I feel for that. Aww... Passing the baton to the next gen. I think it may be based on 18th century man, with white wih and tiny glasses, if you can figure it out.. 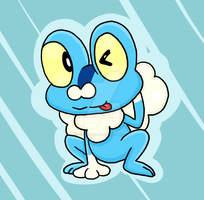 I didn't exactly like Froakie when I saw him (but didn't hate Froakie; just an indifference)...but the more I see him, the more I'm warming up to him, especially the cute little bubble moustache! Me too! Aww this is so cute, it's like Oshawott is passing the baton of latest water starter over to Froakie!